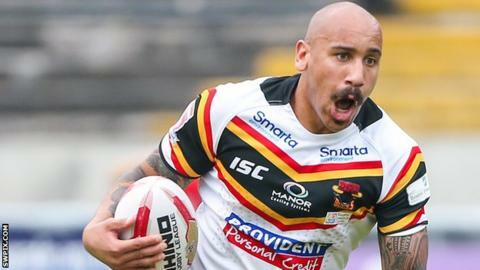 Two tries from Danny Williams and Matty Blythe helped Bradford beat Leigh to improve their chances of making the Million Pound Game. Jake Mullaney crossed to put the Bulls ahead, while Williams extended the lead to 10 points with his first try. Adam Higson and Gregg McNally levelled the scores, but Williams and Blythe touched down to restore Bulls' lead. Bob Beswick's try put Leigh back in contention, before Blythe scored again to seal the two points for Bradford. The result keeps the visitors fifth in the Qualifiers, four points ahead of sixth-placed Leigh, whose hopes of playing in the Super League next season were ended with defeat. Halifax are also four points behind Bradford, but could still take Bradford's place in the Million Pound Game with victory in both of their final two fixtures. Leigh: McNally; Higson, Pala, Armstrong, Kay; Reynolds, Brierley; Moimoi, Higham, Spencer, Haggerty, Goulden, Hock. Replacements: Beswick, Emmitt, Pownall, Wilkes. Bradford: Mullaney; Williams, Blythe, Nielsen, Clare; Purtell, Siejka; Clough, O'Brien, Sidlow, Olbison, Pitts, Addy. Replacements: M. Ryan, Lauaki, Crossley, Ferguson.